The long awaited Ghostie Queen has arrived! 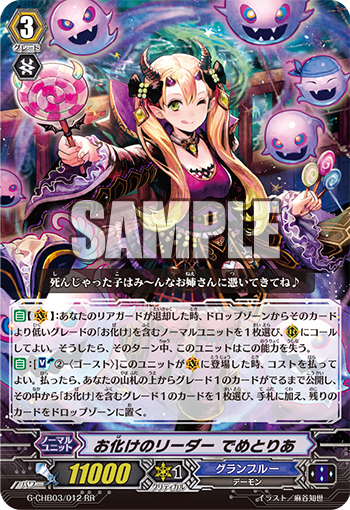 AUTO [V]: When your rear-guard is retired, you can choose 1 “Ghostie” normal unit in your drop zone with a lower grade than that rear-guard, and call it to R. If you do, this unit loses this skill until end of turn. AUTO: [Soulblast 2 <Ghost>] When this unit is placed on V, you may pay the cost. If you do, reveal cards from the top of your deck until you reveal a grade 1 card, choose 1 grade 1 “Ghostie” card from among them, add it to your hand, and put the remaining cards in the drop zone. ACT [R]: Put this unit into your soul] Put the top 2 cards of your deck into your drop zone. If you put a “Ghostie” card into the drop zone this way, SC1, then, if you put 2 “Ghostie” cards into the drop zone this way, CC1. For Today’s Card we’re introducing 2 of 《Granblue》’s “Ghosties” from the 3rd Character Booster “Rummy Labyrinth in the Moonlight” (on March 3rd, 2017) : “Ghostie Leader, Demetria” and “Matt the Ghostie”. “Ghostie Leader, Demetria” is a card that bolsters “Ghostie”. When it’s placed on the Vanguard Circle, you can reveal cards from your Deck until you reach a Grade 1, add 1 Grade 1 “Ghostie” among them to your hand and place the remainder in your Drop Zone. Depending on the cards you draw, you can send a ton of cards to the Drop Zone, allowing you to use cards that shine brightest when Called from the Drop Zone, such as “Skeleton Cannoneer”, as well it works well in tandem with “Mist Phantasm Pirate King, Nightrose” who Calls Units from the Drop Zone. And when your ally Rear-guard is Retired, you can choose 1 “Ghostie” Normal Unit with a lower Grade than that Unit from your Drop Zone and Call it to Rear-guard Circle. By sending vital cards to the Drop Zone, you’ll be able to advance the game to your advantage. And “Matt the Ghost” is a First Vanguard that supports “Ghostie”. By placing itself into the Soul, it can place the top 2 cards of your Deck into the Drop Zone. And, if a card among them is a “Ghostie” card, you Soul Charge 1, and if there’s 2 “Ghostie”, you also Counter Charge 1! In other words, at max, this handy card lets you increase your Soul by 2 while also Counter Charging 1. “Rummy Labyrinth in the Moonlight” has many “Ghostie” Units included, so look forward to further information!